Actually, he wasn’t great. Not at any one particular thing, anyway. He never won an MVP, never won a batting title, never led the league in steals, he hit more than 20 home runs only three times (topping out at 24), he drove in 100 runs only once (in 1999, when he spent much of the year batting 3rd), he always struck out more than he walked (usually a lot more), and he only ever led the league in two things: hits (twice) and runs scored (once, in 1998, the year the Yankees won 114 games). Actually, he did lead in one other thing: plate appearances. Five times. Two of those times were the two times he led in hits. And he cost his team more runs on defense than anyone in history, according to Defensive Runs Saved. Compare that with his onetime best friend Alex Rodriguez, who led the league in runs scored five times, home runs five times, slugging percentage four times, total bases four times, RBI twice, and hits and doubles once apiece. Oh, and he also won three MVPs and a batting title and ended up with a positive DRS total for his career. Jeter did win five World Series, so he’s got A-Rod beat there. You know who else won five World Series? Derek’s teammates Andy Pettitte, Mariano Rivera, Jorge Posada, Paul O’Neill, and David Cone. (Prior to coming to the Yankees, O’Neill and Cone each won a World Series with the Reds and Blue Jays, respectively.) So Jeter was lucky enough to spend his entire career with a team that was always in contention. Is he a historically great player because he has a full hand of World Series rings? No. 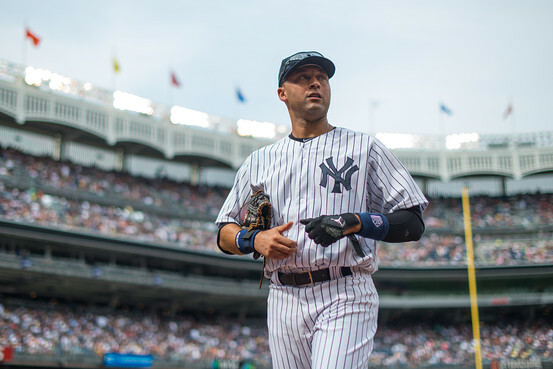 What made Jeter great was his reliability. He was one of the best at literally almost everything — and I mean that word literally — for almost twenty years. Those two seasons he led the league in hits? They came thirteen years apart. He came in third in the MVP voting when he was 24 and again when he was 35. He rarely took a day off or admitted he was injured. He played 148 games or more in fifteen of his nineteen seasons. It was once said that the difference between Alex Rodriguez and Derek Jeter was that when you watched them play side by side, you thought to yourself ‘If I was a player, I’d be like Jeter!’ And you looked at A-Rod and knew you’d never be like him; that he was just one of those better people. Jeter had a rare, unquantifiable quality, an aura about him; he was simultaneously an every man and the best man. What he lacked in ability — not that he was short on that — he made up for in hard work, endless hustle, and a desire never to let down his team, his family, his fans, or himself. He made the players around him better too. In 2012 — the year 38-year-old Derek came in seventh in the MVP voting — he seemed to carry the team on his back. They were very streaky that year — remember the 10-game winning streak in June? — and every time the team was struggling, he would string a bunch of hits together and get them going. On paper, the 2012 Yankees were not a great team: their best pitcher was 37-year-old Hiroki Kuroda, he and Phil Hughes (remember him?) were the only pitchers to make 30 starts, and Robinson Cano was the only player with more than 4 WAR. This was also the year Mariano Rivera was on the disabled list for most of the season. Does that sound like a 95-win team? Well, those Yankees led the American League in wins and were on their way to another World Series when Jeter went down with a broken ankle in the extra innings of Game 1 of the ALCS against the Tigers. With Jeter out, Detroit made quick work of New York, sweeping them in four games. Coincidence? Perhaps. I don’t think so. Let’s not discount the role luck played in Jeter’s career: it’s often said that Luck is what happens when Preparation meets Opportunity. Jeter made sure his Preparation was always ready to meet his Opportunities. He famously had a flair for the dramatic: after the Mets won Game 3 of the 2000 World Series, he homered on the first pitch of Game 4. When the Yankees and Red Sox played a 13-inning game on July 1, 2004, he put his body (and his career) at risk by diving into the stands making sure Trot Nixon didn’t have a go-ahead hit in the top of the 12th inning. He homered for his 3,000th hit and went 5-5 that day, including the winning RBI. He hit a walk-off homer in Game 4 of the 2001 World Series against the Diamondbacks, tying the series and giving himself the nickname Mr. November. He’s the only player in history to win the All-Star Game MVP and World Series MVP awards in the same season. He drove in the game-winning winning run in his last at-bat in Yankee Stadium. He had impeccable timing. He also had impeccable timing for me personally. He liked to say that the reason he always gave 100% was that there was always some kid watching him for the first time. On August 21, 1996, I was that kid. I was a 10-year-old relatively new baseball fan and I went to my first game at Yankee Stadium with my dad and a few friends. The Yankees were playing the Angels, Jimmy Key was pitching, and I can still recite their entire batting lineup from that day. In the bottom of the 1st inning, a 22-year-old rookie shortstop hit Jason Dickson’s first pitch of the game for a home run. Even though the Yankees lost 7-1 that day (primarily due to two home runs by future Yankee Chili Davis), I had a new hero. I idolized Derek Jeter for his entire career. As I grew to love and understand the game more and more with each passing year, I was amazed by Jeter’s consistency. I was also amazed by who he was as a person. This was a guy who was world famous at 22. By age 26, he had enough money to set up his family for generations. Yet he remained unfailingly humble, always putting his team above himself and calling his manager Mr. Torre. He would talk to young fans while he was in the on-deck circle. He founded his Turn 2 charity before his career was two years old. He always kept his cool and was never ejected from any of the 2,744 games he played. Umpire John Hirschbeck called him “the classiest person I’ve been around.” The only time I’m aware of Jeter even getting into an argument with anyone was with his good friend Bernie Williams during the 2001 World Series. 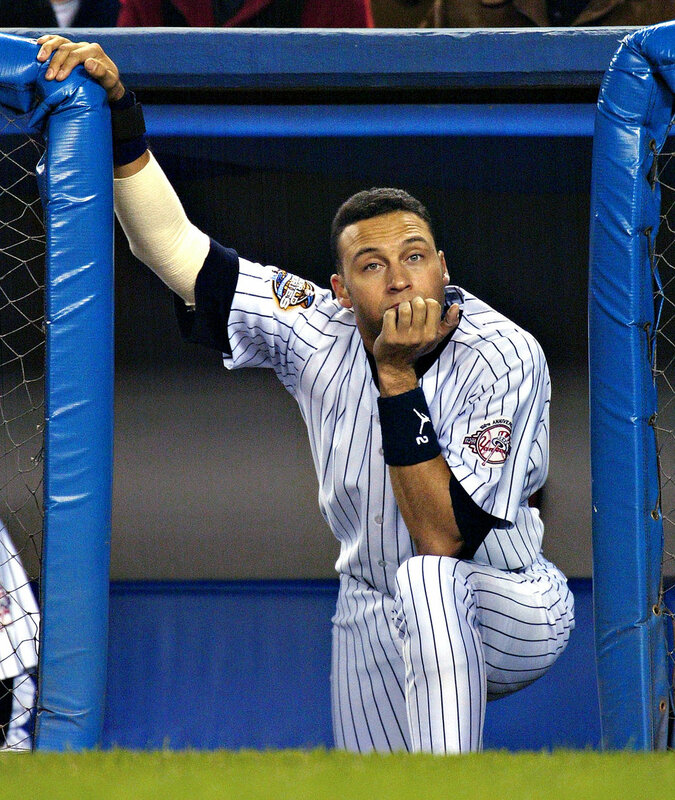 Williams showed up late for a pre-game workout and Jeter, who had not yet been named captain, pulled him aside and yelled at him for not putting his team first. Williams apologized and never made the same mistake again. 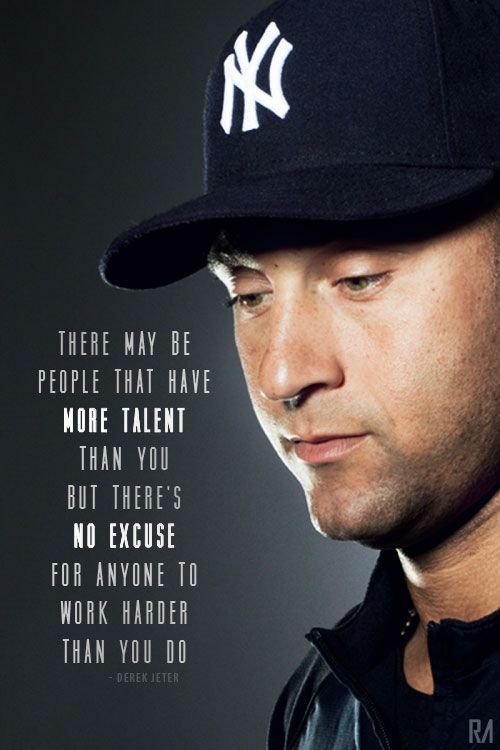 That is the essence of Derek Jeter. He made you not want to disappoint him. He inspired a generation of baseball fans to always remember where you come from and to give back. It speaks volumes that even Yankee haters around the country respected him. He often said he owed everything about who he was as a person to how he was raised by his wonderful parents. I learned that about him early on in his career and identified with him immediately. I too have wonderful parents that I never want to disappoint. Spending my childhood watching Derek gave me an example of someone who never took a day off from working hard both at his job and on himself. I think of his line about there always being some kid watching you for the first time every time I’m onstage. Long after I realized that I would not grow up to a baseball player, I always wanted to grow up to be like Derek Jeter. I still do.